Title: Empty coal train heading west. Description: Empty coal train heading west. Description: Three executive scheme SD70MAC's pass on the double track just east of Jamestown. 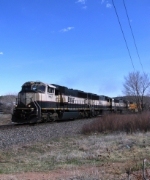 Description: A quartet of SD70MAC's tug a empty coal drag north out of Colorado Springs. Description: another meeting of dpu's. I got lots of dpu meets but only a few head end meets. Description: A executive passes under the generic new signal bridge at Montgomery. The old signal bridges have been completely demolished. Description: The DPU on this southbound TXUX train is a mix of attractive units, a BN Grinstein SD 70, and a KCS Belle, presently the best looking paint scheme in America. Title: Empty Coal stopped at a signal. Description: Coal train headed northeast into New Mexico. Description: NS Southbound Coal Train 736 DPU power pushes on the rear as they pass through Bolton, Ga. Title: 2 Cream n greens work a coal load SB. Description: Headed down the Fort Scott Sub as last light falls on the junction. Description: BNSF C44-9W #4774 leads a Z-train through Bealville high up on Tehachapi Pass followed by ATSF Warbonnet C41-8W #940, Executive SD70MAC #9817, and ES44C4 #6630. Description: BNSF Executive SD70MAC #9817 trails on a Z-train as it heads up Tehachapi Pass at Bealville. Description: ATSF Warbonnet C41-8W #940 and BNSF Executive SD70MAC #9817 help lead a BNSF Z-train up Tehachapi Pass at Bealville. 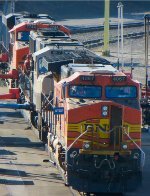 BNSF C44-9W #4774 is in charge of this high-priority train. Description: BNSF C44-9W #4774 leads a Z-train through Tehachapi followed by ATSF Warbonnet C40-8W #940, Executive SD70MAC #9817, and ES44C4 #6630. Description: BNSF Executive SD70MAC #9817 trails on a Z-train as it rolls through Tehachapi. Description: BNSF 4067 - BNSF 9817 - BNSF 7744 at the snackbar, water and fuel topping off tanks in the service area at Vancouver.